I don’t even like meatloaf but this Keto Meatloaf was awesome! My kids and my parents love it. Almost any side dish you like will go well with it! 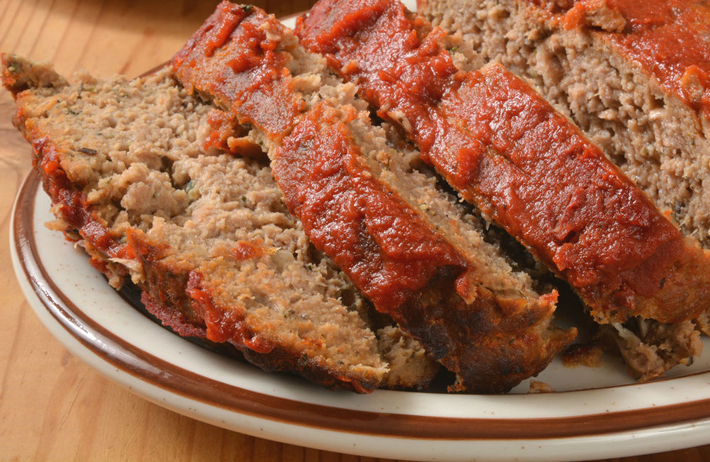 This Keto Meatloaf is delicious, low carb and gluten free. Flavor was amazing. It was excellent, moist, tender and flavorful. There were no leftovers. Will be making again for sure! Heat olive oil over medium high heat in small skillet. Add onions, thyme and garlic and cook until fragrant, taking care not to burn. Set aside and allow to cool. In a large bowl, combine ground meat mix, salt and pepper, egg, pork rinds, parmesan, parsley, mustard, hot sauce and whipping cream. Add in onion mixture. Combine with your hands until all ingredients are incorporated. At this point the mix should be sticky but combined. Pat the mix into a free form loaf shape. Place on baking sheet (I top mine with a sheet of tin foil to simplify cleanup). Combine tomato paste, vinegar and sweetener until thoroughly incorporated. Using a pastry brush, top the meatloaf to create a glaze. Bake for 40 minutes or until the internal temp of the meatloaf reads 160 degrees. Serve and enjoy! 398 calories, 30.5 grams fat, 3.1 grams carbohydrate, .4 grams fiber (2.7 grams net carbohydrate), 36.2 grams protein.